The curtain has fallen on the 33rd Season of Oklahoma Shakespeare in the Park. The final performance was Hamlet. 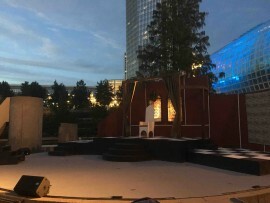 Set on the Water Stage in the Myriad Gardens, the OSP company made major improvements in their performances since the first show of the season. While Taming of the Shrew was an ambitious disaster, the performance of Hamlet looked as if is the best of Bard for the year.Lance Marsh is a veteran director of Shakespearean plays. As a professor of theater at the University of Central Oklahoma, Marsh is aware of the importance of each character and each scene. On the concrete, circular stage, a simple two-tier set with Danish sigils hanging in the windows faces the audience. In the middle of the second tier is a dining room chair molded to look like a white throne. The set was simple. But the actors remained as interesting and complex as written by Shakespeare. This production of Hamlet was refreshing. It was as though theater provided before and after photos of how acting should be done. In this case, Hamlet was a shining light. Hamlet is considered by many literary scholars as Shakespeare’s best play. The subtleties of the dialogue pair well with the complex characters and the even more complex questions. Ideas dealing with death and the afterlife, suicide and insanity, and feminism are scattered throughout the play. A difficult task but one that was well done by the company. Before the show began, Marsh announced that OSP had signed a five year deal with the lead of the show to star in the upcoming productions. As a veteran of Shakespeare in the Park, I was skeptical. Lighting for the stage dimmed to a dark blue and the sounds of a sad violin crackled over the speakers. The actors were dressed in English Renaissance clothing. It’s too often that the costumes can distract an audience from enjoying and engaging in the story. Much like the set, the costumes were simply vessels for the story. Hamlet opens with two Danish guards speaking of a ghost patrolling the grounds beyond the woods of the castle. Tensions rise between Prince Hamlet and the rest of his family due to the suspicious death of Hamlet’s father, the king. The king’s brother, Claudius, now sits on the throne and is married to Hamlet’s mother. On a dare by Hamlet’s friend Horatio, Hamlet went to the woods to confront the spirit. What Hamlet would find is the spirit of his dead father telling him the truth behind Claudius: his brother murdered him in his sleep in order to be in charge. Oklahoma Shakespeare in the Park took a gamble with this production. It would be easy to cover an actor in baby powder and chains to stagger across the stage. Instead, they hiked the eerie music and used a deep voice-over. The effect was instant. The audience began to look around hoping to catch the glimpse of the ghost only to find an empty void. What this does is express Hamlet’s madness. He speaks to spirits not seen and pleads for revenge to a plot unknown by all those in the story. It is madness through and through. This is what makes this production of Hamlet powerful. Community theater often has a reputation of over-acting for the sake of theatrics. It’s not uncommon for a 40-year-old man to shout Hamlet’s soliloquy in triumph, or for the characters of Rosencrantz and Guildenstern to be portrayed as bumbling fools. By the second scene, my skepticism had changed to optimism. Hamlet was played by Luke Eddy, a professor of Acting and Stage Combat for Oklahoma City University’s School of Theater. From the moment he stood off from the crowd to his dying monologue to Horatio, I knew this man was Hamlet’s god-send. There was no denying Eddy’s ability to control the scene, even if he wasn’t the center piece. It was never in an intentional way; it was a commanding presence. What made it for me was Eddy’s ability to make each act he performed as real as the people watching. I could believe his hatred of Claudius for murdering his father. I could believe his distrust of his own sanity. I could believe his death as a noble sacrifice, hell bent on justice and destruction. “To be or not to be, that is the question,” Eddy recites while sitting on the floor with a heartbroken Ophelia played by Kathryn McGill. This monologue was the first time since first reading the passage in high school that I got goosebumps. Marsh was able to make each character from the story a three dimensional being capable of envy, hatred, and love. Each person had their equal moment to shine whether it was through tragedy or comedy. The language used in Shakespeare’s plays often goes over people’s head. Since it is a mixture of old and new English, the translation relies on the actions of the actors. I was able to feel every sense of scorn, sarcastic remark and heartbreak with the characters. As the actors took their final bow, Eddy stepped to the front of the stage to address the crowd. Eddy is a Houston native and his family was affected by Hurricane Harvey. Orange donation buckets were left on the ground by the staircase leading out of the water stage. I look forward to the company’s 2018 season.